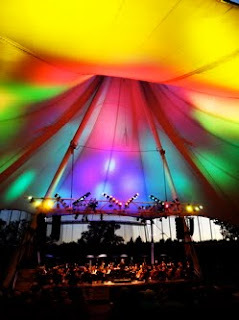 Today was the start of the Edmonton Symphony's Orchestra's Symphony under the Sky Festival! 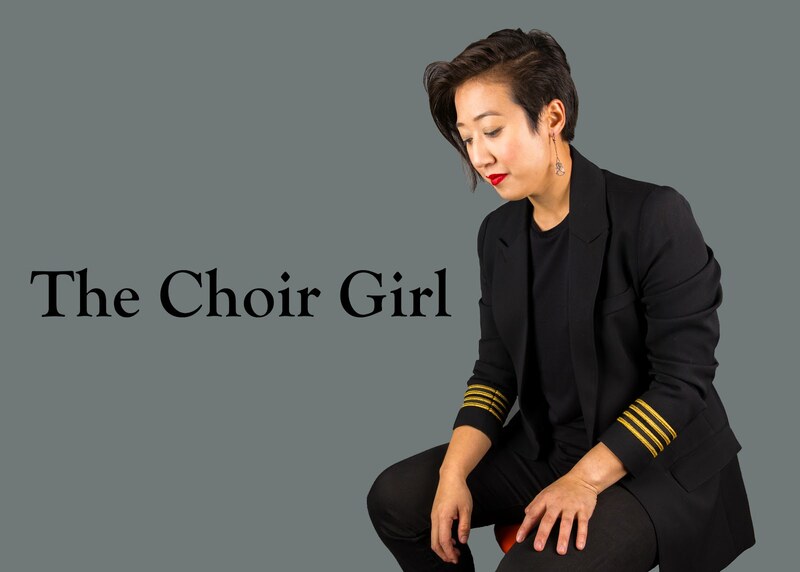 If this is news to you, feel free to read my concert previews in a previous post here. The evening did not disappoint. The weather was lovely and warm (even after the sun set). 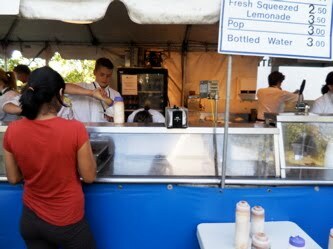 There were lots of delicious food vendor options. Tis' the last chance to purchase hotdogs, mini donuts, and lemonade in a festival atmosphere. The music, apart from some mic issues, was pleasant and well-executed. The program tonight included Bach's Fuge a la gigue in G Major which was light and dancy. This was followed by Bach's Sheep May Safely Graze which reminds me of Christmas and vocal memories of tense solo soprano singing in children's choirs. The violin melody did not sound vocally tense to me... it's just my own personal memories. Following these pieces was Prokofiev's Violin Concerto No. 2 in G minor op. 63. The violin soloist was Karen Gomyo playing on a Stradivarus violin which was purchased by a private sponsor. Upon reading that in the program, I tweeted a message saying that I wished I had a private sponsor :) Gomyo was dressed in a long flowing red gown and played with flexibility and sensitivity. 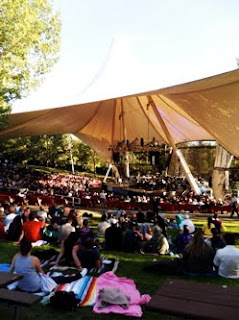 I often find violin players extremely stiff but her body was willowy and responsive to the musical workings of the Edmonton Symphony Orchestra behind her. She really showed her technical prowess in the last movement of the concerto which elicited a warm round of applause and standing ovations at the end. Following intermission, two quick musical themes from Beethoven's Symphony No. 1 in C Major, Op. 21 were introduced by the conductor, Bob Bernhardt, so that the audience could listen for them. He played an excerpt from the "Menuetto" movement and noted that Beethoven's version, though in 3/4 time, wouldn't have been danceable due to its quick pace. Therefore, it was renamed as a "Scherzo" which means "joke" in Italian (as pointed out to me in the program). As well, though the piece is supposed to be in C Major, the first movement actually begins with a dominant-tonic chord sequence in the wrong key. Oh, Beethoven, you jokester! The evening was topped off with Brahms' Hungarian Dance No. 5 and No. 6. Brahms' Hungarian Dance No. 5 has been a musical favorite of mine for a long time. Back when there was Napster, it was one of the first classical songs I downloaded! Tomorrow I'm heading out again to listen to the film scores of John Williams! I've posted some photos of my evening below. Enjoy! 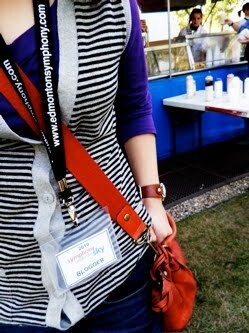 I received a special blogger nametag! 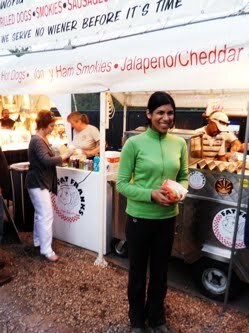 Nadia with her veggie dog from Fat Franks. Thanks for coming, and for posting so quickly! It's easy to get posts written quickly when there's inspiration! Thanks again for inviting me!